Right Prices Tiles and Wood Flooring in the Oranmore Business Park, has a 7,500 square feet showroom and warehouse offering customers an increasing range of laminate flooring. The store is located behind the Maldron Hotel on the Oranmore roundabout. There is no need to battle the traffic of the city centre, simply pull in, enjoy ample free parking at the front of the building, browse to your heart's content, pick out your choices, load up, and go home satisfied. It is literally as simple as that. Business owner Cyril McCluskey says; "Wooden floors have definitely increased in popularity, especially laminates. They are very hard wearing and are a good long term investment." 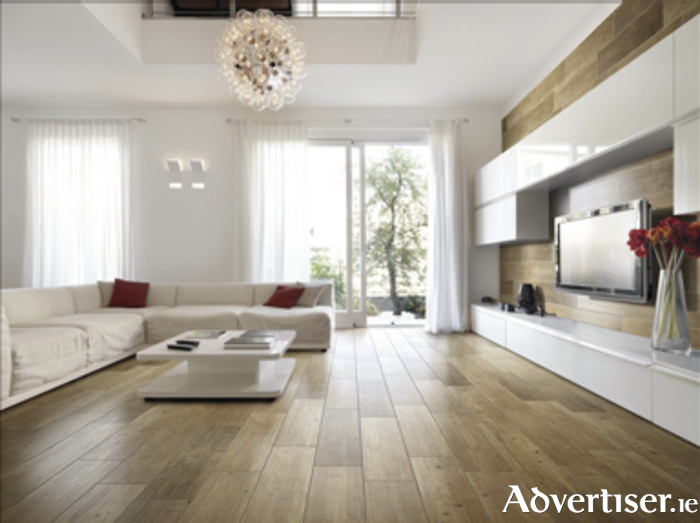 A beautiful range of wood floors is on display with laminates ranging from 7mm - 12.3mm available. "12.3mm laminates in particular have proved a favourite with our customers as the texture, look, and sound under foot is so similar to the more expensive solid wood flooring." The laminate comes in a number of finishes from natural to glossy and rustic, V groove, and plank effect. "We have a full range of accessories from underlay to matching skirting and scotias to complement your flooring choice for the DIY and professional fitter alike." A trip to Right Price Tiles and Wood Flooring is certainly abundant with choice. "It has been said more than once by our customers: "I cannot make up my mind, there is too much to choose from," and once you visit the store, you will understand why. Between the vast displays and array of quality products, it will encourage you to kick start that renovation project that has been on your mind. This year, Right Price Tiles and Wooden Flooring is one store you must make your way to, for the best stock, value, and advice on flooring. So call 091 792972, or drop in to the newer, brighter, store @ Right Price Tiles and Wood Flooring at the Oranmore Business Park, behind the Maldron Hotel.